Her lack of awareness always made me giggle, because of course she was one to gossip. In fact, she was usually the first one to gossip. I tried everything under the sun to squelch the gossip: Change the subject. Avoid eye contact. Look busy. Tell her I didn’t feel comfortable hearing negative things about co-workers. Counter negative comments with positive ones. No matter what I tried, nothing worked. Looking back, I suspect it’s because she genuinely didn’t think she was a gossip. I don’t know what ever happened to her, but I’ll bet she encountered a few lost friendships, and a host of hurt feelings over the years. Last week I wrote an article for Crosswalk called “10 Types of Gossiping People”. 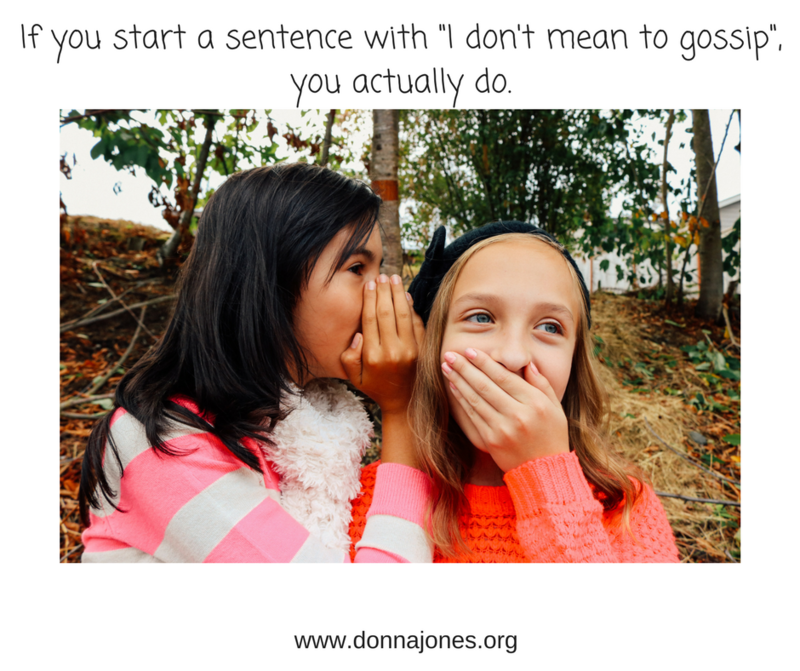 I must admit, writing the article opened my eyes about ways we gossip and (sometimes) don’t even know it. It’s a great conversation starter with your friends, small group, and especially your family (pre-teen or teenage girls, anyone???) Check it out!